Hani is a large, light-weight insect monster. For the most part it is incapable of flight, however, they have been known to flutter for a few moments in life or death situations. For the most part, Hani's wings are left to gently sway in the wind, but can be flapped quickly to reduce its body weight while running. This allows for surprising speed and stamina when traveling long distances. As it ages, small eggs begin to form under Hani's whispy fur. Hani will busily harvest pollen from various flora, causing a special type of ultra-nutritious honey, Royal Jelly, to form inside its hollow body. 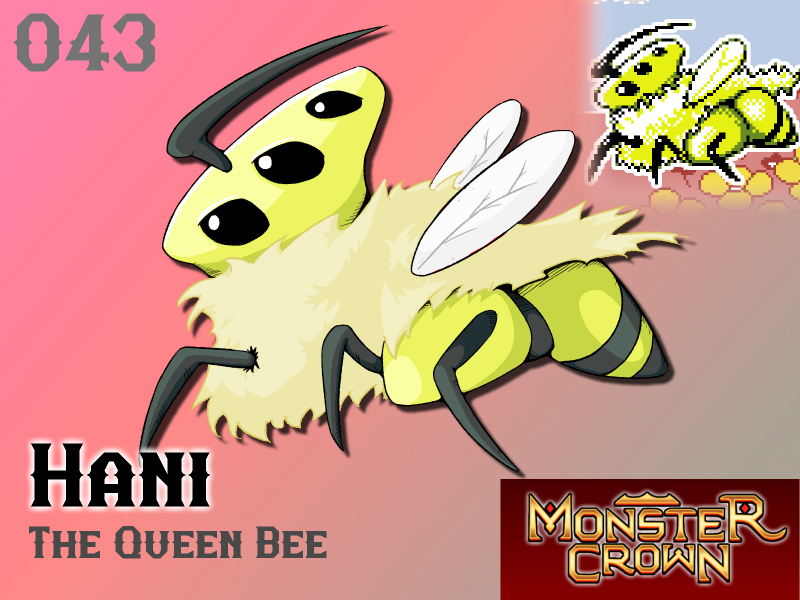 Hani can feast on a portion of the Royal Jelly, which will provide a generous all-around stat boost during tense battles. When Hani reaches the end of its lifespan it will find a secluded location to build a nest from the remains of its whispy coat. Afterwards, Hani will remain perfectly still and over the period of a few days, dissolve entirely. The eggs left behind will soon hatch into baby Hani who will nourish themselves on the pool of Royal Jelly left by their hardworking mother. Will Hani make your team?